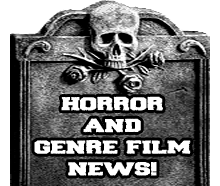 Cinematic Autopsy: Get ready to throw away those crappy public domain DVD's! Kino Lorber Set To Release "Night Tide"! Get ready to throw away those crappy public domain DVD's! Kino Lorber Set To Release "Night Tide"! Kino Classics is proud to announce the Blu-ray and DVD release of Curtis Harrington's landmark independent horror classic, Night Tide, starring Dennis Hopper in a new edition mastered in HD from 35mm elements restored by the Academy Film Archive, with support from The Film Foundation and Curtis Harrington. 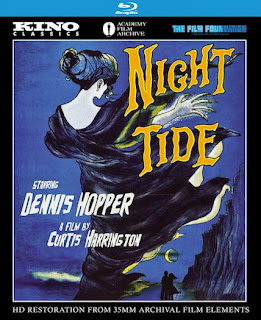 Night Tide ranks right up alongside Night of the Living Dead and Carnival of Souls as one of the most influential indie horror films of the 1960s. It launched the career of director Curtis Harrington (Queen of Blood, Ruby), and stars Dennis Hopper in an early leading role which helped establish him as one of cult cinema's most eclectic leading men. This edition from Kino Classics streets on October 15th with a SRP of $29.95 for the Blu-ray and $24.95 for the DVD. It includes audio commentary by Curtis Harrington and Dennis Hopper; a two-part interview with Curtis Harrington by David Del Valle (1987, 55 min. ); and the original theatrical trailer. Night Tide tells the story of a sailor on shore leave who becomes fascinated by a woman who poses as a mermaid in an oceanfront carnival. As their relationship blossoms, Johnny (Dennis Hopper) realizes that Mora (Linda Lawson) is more than a sideshow illusionist. She seems to be a descendent of the mythical sirens of the sea, and is under the mesmeric control of a mysterious woman (notorious occultist Marjorie Cameron) who beckons Mora to return to her home beneath the waves.